Minnesota would generate a projected $10.8 to $15.1 million in new tax revenues from Sunday sale of beverage alcohol. When Colorado passed Sunday beer sales the increased revenue was credited with bringing liquor stores through tough economic conditions. Other states have profited from rolling back blue laws. Data was collected on the twenty stores to determine if Sunday openings adversely affected sales on Saturday and/or Monday. 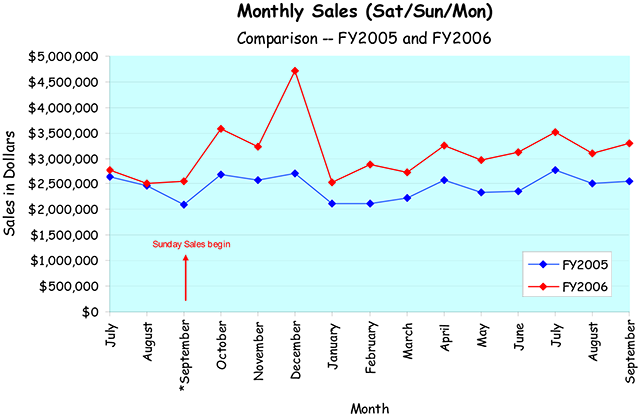 Comparisons between the first year of sales for the Sunday Sales Pilot Project and the prior year were done for Saturday, Monday, and the 3-day period Saturday-Sunday-Monday. Through the first 12 months of the project sales on Saturday increased 11.4 percent; Monday sales increased 2.2 percent; and when you include Sunday, the 3-day period increased 31.3 percent. This compares to 23.8% for non-Sunday stores during the 3-day period (an increase of 7.5%). A study of the sales figures would eventually conclude that being open on Sunday increased sales far in excess of the additional staffing costs. At the outset of the program, the Washington Liquor Control Board staff estimated that it would see increased sales worth $9.55 million in the first two years of Sunday sales, while increased staffing and store costs were estimated at $1.43 million. The actual increase in sales among those in the program over the first two years: $18.5 million.